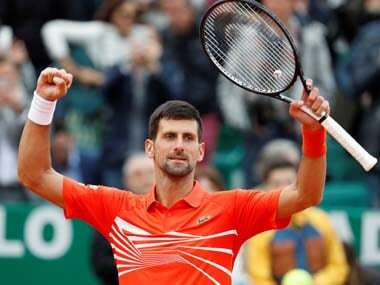 Monte Carlo: Novak Djokovic was severely tested before securing a 6-3, 4-6, 6-4 win over Philipp Kohlschreiber to survive his opening match at the Monte Carlo Masters on Tuesday. "It was a difficult match, there were lots of breaks (a run of eight straight during the second and third sets). There were lots of ups and downs. It was not the prettiest of matches. He played well, but a win is a win. This was a tough first match of the clay season. I had to figure out how I needed to move, this kind of match can be expected. It was probably good for me to spend so long on the court," Djokovic said. Djokovic, who lives in the Principality, is playing his 'home' event for the 13th time in 14 years, winning it in 2013 and 2015 and losing in the final on two other occasions. Defeat in just over two hours left 2014 US Open winner Cilic with just one win from six matches since January's Australian Open, where he went out in the fourth round. "This is my best surface, I knew I had chances. But I had to play well. I was a bit nervous at the start, it was my first time on this court. But playing here is a dream — it's unreal," the world number 35 said. Elsewhere, 2014 champion Stan Wawrinka collapsed after a strong start to a 0-6, 7-5, 6-3 loss to Italy's Marco Cecchinato, who reached the French Open semi-finals last year. "I like the conditions here. Everything is kind of on top of each other. It's pretty sick kind of playing tennis on the side of a mountain with a water view," he said. The 18-year-old Auger-Aliassime, who reached last month's Miami semi-finals as a qualifier, now boasts a ranking of 33rd, up from 175th when he played here a year ago. "I'm very happy to win my first match after Miami, because I didn't know what to expect," he said.